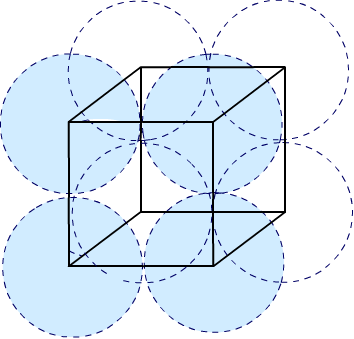 A unit cell of simple cubic lattice contains one atom. Let the side of a simple cubic lattice is ‘a’ and radius of atom present in it is ‘r’. The edge of a unit cell is ‘a’. Molar mass of unit cell is ‘M’. Number of atoms present in unit cell is ‘z’. Mass of each atoms present in unit cell is ‘m’. Where, d is density, z is number of atoms present in unit cell, a is length of edge, and NA is Avogadro constant. Above expression has five parameters, d, z, a, m and NA . By knowing any four of them fifth can be calculated.